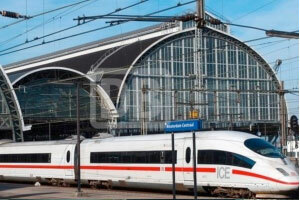 With the Railteam network of high-speed trains, the journey from Frankfurt am Main to Amsterdam never takes more than four hours. But as there are so many interesting places and regions to explore along this route, you may want to make it last several weeks. 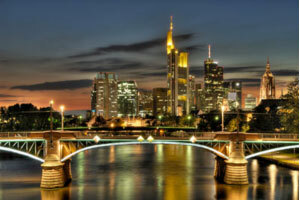 The trip starts in Germany’s financial centre, Frankfurt, which really comes to life by day. Well over 1.5 million people work in the city that actually has only 670,000 inhabitants. Every day, the Deutsche Bahn rail network transports hundreds of thousands of workers into the city, which is known for its ‘Äppelwoi’ – the apple wine so beloved of the Rhine-Main region. But this city on the River Main has a lot more to offer than just its apple wine. Frankfurt has a particularly lively cultural scene, for example. A unique museum district has sprung up over recent years along the banks of the river, with more than 60 museums and exhibition halls of all shapes and sizes. First stop on the journey out of Frankfurt is Frankfurt Airport, which, along with the Port of Hamburg, is the German gateway to the rest of the world. Our route then follows the Taunus Mountains, a low mountain range that serves as kind of local park for the people of this region. The Taunus region is particularly famous for its mineral springs and therapeutic waters, which have been attracting visitors since Roman times. ICE 3 trains travel through the Taunus and Westerwald regions at speeds of 300 km/h on the high-speed section of track inaugurated in July 2002. As you look out of the window at the A 3 motorway running parallel to the railway, you will be able to appreciate just how fast these trains race through the hilly countryside. With a power output of over 8,000 kW, these trains leave the lorries far behind as they struggle over the hills at just 90 km/h. And so it is that merely an hour later, passengers arrive in the city of Cologne. Those who step off the train in Germany’s fourth-largest city will be treated to a fantastic sight the minute they arrive. 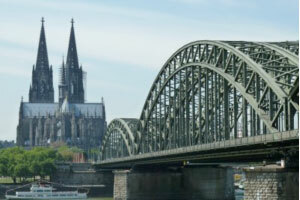 For right outside the city’s main railway station stands Cologne Cathedral, Germany’s most visited landmark, attracting on average 20,000 visitors a day. This architectural monument was never really completed. For four years, from 1880 to 1884, it stood as the tallest building in the world at 157 metres. The cathedral is the city’s flagship monument and the starting point for most city tours. In the historic centre, or ‘Altstadt’, which begins just a few metres away from the cathedral, some kind of carnival takes place more or less all year round. In any case, those who like to party will be well catered for throughout the year. The next stop is Düsseldorf, the capital of Germany’s most densely populated region, North Rhine-Westphalia. As the fashion capital of Germany, Düsseldorf is shopping heaven and one of the biggest economic centres in the country. The elegant shops on the Königsallee attract a well-heeled clientele. Just a few hundred metres away, the city’s quaint historic centre bustles with a mixture of tourists, locals and people from the surrounding area, who all come to enjoy the lively atmosphere– and not just on Friday and Saturday evenings. There’s something going on in Düsseldorf’s Altstadt, also known as ‘the longest bar in the world’, every day of the week. The journey continues to Arnhem, the first town after the Dutch border. Although it has a population of only 150,000, this town is a real gem for tourists. Gently rolling hills are ideal for hiking and cycling, and the town centre is truly beautiful. For a town of this size, the cultural scene is nothing short of impressive. Arnhem is particularly popular with the Germans and the Dutch for its shopping opportunities. The last stop before our final destination of Amsterdam is Utrecht. This town is a good foretaste of the great city of Amsterdam, as it is like a miniature version of the capital, which is only 50 kilometres away. The town centre with its ‘Oude Gracht’, or ‘old canal’, is like an open-air museum, which comes alive with all walks of life. Apart from the canal, the other main attraction in the historic town centre is the cathedral, which is one of the most important churches in the Netherlands. The nave collapsed in 1674 during a thunderstorm and there has been a gaping hole between the transept and the West Tower ever since. One of the best ways to enjoy Utrecht is to sit and have a drink in one of the traditional taverns in the old part of town as you watch the world go by. Just a few minutes’ away by train from Utrecht is the final destination of our journey. As the official capital of the Netherlands and with 800,000 inhabitants, Amsterdam is the largest city in the country. Greater Amsterdam actually has a population of 2.3 million. Due to the soft and sandy soil, old parts of the city were built on some five million piles, many of them wooden, with some of these being replaced more recently with concrete foundation piles. The main station, for example, was built on around 8,600 piles. The city is not famous for its foundations, however. It is world-famous as the cultural centre of the whole country. Most visitors are attracted to the city’s Rembrandtplein district, which thanks to its theatres, cinemas, bars and restaurants is one of the best-known areas in Amsterdam for going out. With museums such as the Rijksmuseum, churches such as the Westerkerk, the Vondelpark, the impressive buildings from the Amsterdam School of Expressionist architecture, and not forgetting of course the city’s many canals, it really is impossible to get bored in Amsterdam. And what could be better after an exhausting day spent in the throng of the city’s narrow streets than to sit back in a relaxed and peaceful compartment of the train? In less than four hours, you will find yourself back in Frankfurt.